A Hero, Not a “Criminal” – She Must Not Die in Prison! 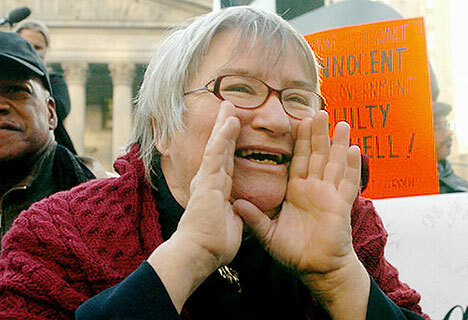 Lynne Stewart speaking at rally on day of her sentencing, 16 October 2006. For decades, Lynne Stewart defended the downtrodden and oppressed, the victims of a government that tortures and murders with abandon and has locked up a higher proportion of its population than any other on the face of the earth. Lynne was jailed in 2009 for defending her client and refusing to let the government silence him. Already battling breast cancer when she was imprisoned, after being forced to wait 18 months for scheduled surgery she discovered that the cancer had returned. It is now diagnosed as Stage 4, having metastasized to her lymph nodes and lungs. Lynne must not die in prison – we demand she be freed now! Some 16,000 people have signed a petition calling on prison authorities to order Lynne’s immediate release in the care of her family, so that she can receive urgent medical treatment at Sloan Kettering Hospital. One month ago, the warden at Carswell federal prison in Texas signed off on a “compassionate release” for Lynne. The clock is ticking and those papers are still sitting on a desk in Washington, D.C.
“In her current setting, where trips to physicians involve attempting to walk with 10 pounds of shackles on her wrists and ankles, with connecting chains, Lynne Stewart has lacked ready access to physicians and specialists under conditions compatible with medical success. “It can take weeks to see a medical provider in prison conditions. It can take weeks to report physical changes and learn the results of treatment; and when held in the hospital, Lynne has been shackled wrist and ankle to the bed…. In 2005, Lynne was originally sentenced to 28 months for the “crime” of violating an administrative memo, the “Special Administrative Measures (SAMs)” imposed on her client, the blind Islamic cleric Sheik Abdel Rahman. The conviction itself was an abomination and frontal assault on democratic rights, upholding the government’s “right” to hold prisoners it doesn’t like incommunicado by administrative fiat, and then to enforce the gag order by jailing their layers for “violating” the ban (see “Lynne Stewart Conviction is Legal Terror,” The Internationalist No. 21, Summer 2005). But that was not enough for a government that under Republicans and Democrats alike has ridden roughshod over the rights supposedly guaranteed in the U.S. Constitution. Freedom of speech and association, bans on cruel and unusual punishment prohibition of unreasonable search – the government has taken aim at all of these. And so in 2010, a panel of federal judges, in a virtually unprecedented action, forced the trial court to impose a ten-year sentence. If the original sentence had not been punitively increased, she would be home by now. From the outset, the Internationalist Group has stood with Lynne Stewart, in the courtroom and at demonstrations calling to “Free Lynne Stewart” and to defend her translator Mohammed Yousry and paralegal Ahmed Abdel Sattar who were convicted along with her in the frame-up trial. We owe a particular debt to Lynne, for her defense, even while she was facing trial herself, of Miguel Malo, a student who was framed up by college police at Hostos Community College for his defense of the rights of immigrant students .